 Celebrate with an artichoke baked potato (photo courtesy Bonefish Grill; recipe at right). The flower [not shown] grows in the center top of the globe, which grows atop a long stem (photo courtesy Frieda’s Produce). 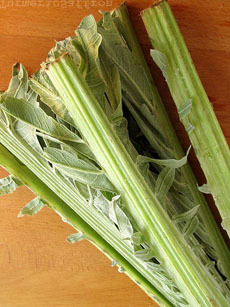 It looks like celery, but these are cardoons, the ancestor of the artichoke (photo courtesy Turmeric Saffron). It combines artichokes with hearts of palm, roasted red pepper (pimento), red onion and black olives in a white wine vinaigrette. Here’s the recipe. But we’re all about options, and we’re making a stuffed baked potato from some of the artichoke hearts. We were inspired by this photo from Bonefish Grill. The elaborate recipe topped with an artichoke heart seems an elegant way to celebrate National Artichoke Hearts Day. 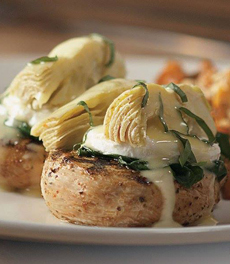 The potato is stuffed with some sautéed spinach, then crowned with a poached egg and the artichoke heart. 2. Sauté the spinach and poach the egg(s). Warm the artichoke heart(s) in the microwave. 3. SLICE the top off the potato(s) to provide an even platform. Scoop out a bit of the potato to create a shallow well for the spinach. 4. FILL the well with the spinach, top with the poached egg and hollandaise sauce. Crown with the artichoke heart, sliced in half as necessary. Garnish with the tarragon. The artichoke (Cynara cardunculus) first grew wild in the Mediterranean. It is a member of the thistle family of flowering plants. The wild version of the artichoke, which still grows wild and is also cultivated, is the cardoon (photo #3). While it doesn’t look like the globe artichoke that has become part of the modern diet, it tastes very similar. The artichoke is first found in print as a garden plant in the 8th century B.C.E., by Homer and others. Centuries later, Pliny the Elder mentioned the growing of “carduus” in Carthage (North Africa, where it is still found in its wild state) and Cordoba (Spain). Further cultivation took place in the medieval period, and subsequently in Italy and France in the late 15th and early 16th centuries. 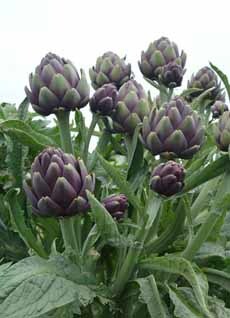 Different varieties of artichokes were bred and cultivated, some as small as a hen’s egg, others larger than a first. Typically, the leaves are eaten; but the prize is the “heart” under the choke, the inedible thistly part on top of it. We enjoy eating the stems. If they are on the artichokes you buy, don’t throw them away! Like asparagus, the bottom portion may need to be peeled. But the stem has the flavor of the artichoke heart. Try it, you’ll like it. The ancestor of our word “artichoke” comes from Arab-occupied Spain. An Arabic word for the plant, al-karsufa, turned into the Spanish alcarchofa. Dutch traders introduced “arti-choke-ohs” to England, where the name was anglicized to artichoke. In 1530, artichokes were noted growing in Henry VIII’s garden at Newhall. Artichokes crossed the pond in 19th century, brought to Louisiana by French immigrants. Spanish immigrants brought them to California. Artichokes are now popular in American cuisine: baked, braised, fried, marinated, steamed; and in preparations from antipastos to dips to relishes/salsas, salads, soups and stuffings.